Our proposed solution is centered on making phone calls selectively expensive for robocallers by using virtual currency that we call FTC dollars. Each known phone number has a monthly calling budget maintained by the FTC, which is seeded with an initial endowment at the beginning of each month. The callee's service provider flags calls that are likely to be robocalls based on a combination of explicit feedback from the callee, and automated detection techniques (eg, based on the duration of the call). For each call the callee's service provider reports to the FTC whether the call was flagged. Each flagged call decreases the caller's budget by a certain amount (say x FTC dollars), whereas each unflagged call adds to the budget (say y FTC dollars). 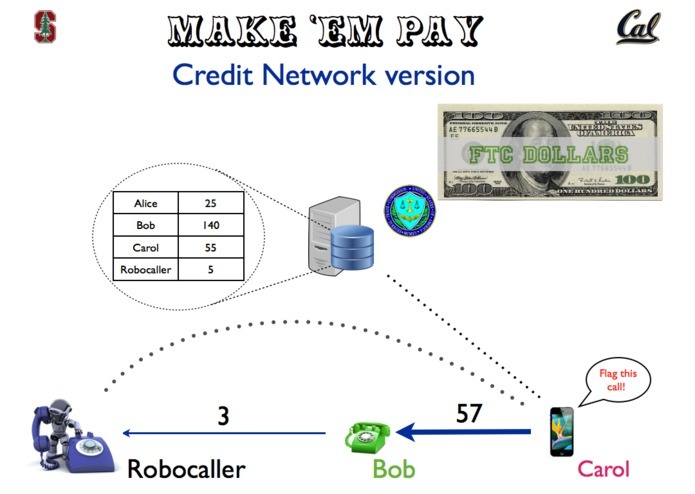 If a caller depletes his budget, he is likely a robocaller and is penalized in some way, eg, calls blocked, higher calling rate or having to solve an audio captcha. This approach may be vulnerable to an attack where robocallers set up receiving phone banks to harvest FTC dollars. This vulnerability can be overcome by incorporating credit networks into our approach. Credit networks are based on mutual trust between numbers instead of a global notion of trust. In this approach, the FTC server stores a calling budget for every pair of phone numbers. We transitively propagate trust in the network: a call is connected if there exists a path of non-zero trust from the callee to the caller. Recent work has shown that finding these paths of trust is no harder than finding shortest paths in the network which can be done pretty efficiently at scale using modern computing infrastructure. Such a service can be rolled out locally, selectively by the Telco receiving the call, and is transparent to the regular end user.